Valentino's supplies wooden double ended panel Platform Trolleys. A flexible modular system with the interchangeable end and side panels. Heavy duty design - 500kg loading capacity. 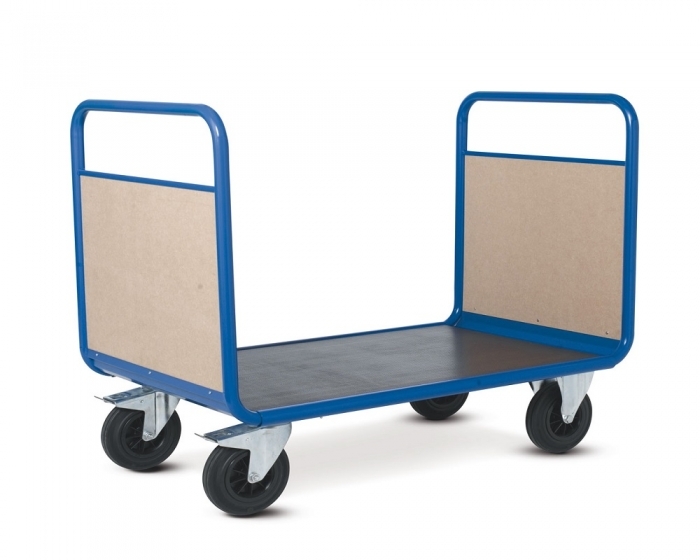 These platform trolleys will suit all applications and are ideal for office, retail and warehouse use. Water and weather proof makes these platform trolleys suitable for outside use. Manufactured in the UK. Complies to EN 1757-3. Fitted with 2 braked and 2 un-braked 200mm rubber tyred castors. Platform size: 1000mm (L) x 700mm (W). IMPORTANT Our 14 Day Money Back Guarantee does NOT apply to these products. A flexible modular system with the interchangeable end and side panels. Heavy duty design - 500kg loading capacity. These platform trolleys will suit all applications and are ideal for office, retail and warehouse use. Water and weather proof makes these platform trolleys suitable for outside use. Manufactured in the UK. Complies to EN 1757-3. Fitted with 2 braked and 2 un-braked 200mm rubber tyred castors. Platform size: 1000mm (L) x 700mm (W). IMPORTANT Our 14 Day Money Back Guarantee does NOT apply to these products.